As the art of cinema develops alongside technology, so does the business of it. Methods of distribution and viewership are now more varied than ever, however, what some may not fully consider is that aside from method of viewing (streaming, MOD, DVD, etc.) theatrical releases also have found new paths. Now more than ever theatrical releases have tinkered with the formula. It used to be an unwritten rule that the rest of the world would have to wait for Hollywood films until America had seen it first. Now, for many reasons whether it be location or just the international viability of a given project, films are not only premiering overseas with increasing frequency but opening there well ahead of the US also. Perhaps the best example of this is Steven Spielberg’s The Adventures of Tintin. I for one had always had a vague awareness of Hergé’s well-known creation but didn’t know much about him or the stories in which he lived. However, similar to my affinity to The Little Prince, which crosses not only various media but also three languages, I knew that it was a property more renowned abroad than in the US. Therefore, it’s perfectly logical that not only did Tintin debut overseas first but also opened there well in advance. Tintin, one of the best animated films I’ve seen in a long time! Such well thought out characters and beautiful animation! Tintin was brilliant! […]The 3D was great but could’ve been better utilized. The biggest win for this production, however, was a chaotic sequence which never seemed to end. It was very reminiscent of the Indiana Jones days where everything fell into place and the characters had to pull off stunts just at the nick of time. Of course, this is a lot easier to accomplish when every movement is animated by a computer rather than a stunt double. In the end though, the action scene came out so well that it makes you want to watch the entire film again just to watch that portion. If it was on DVD or DVR, you would instantly rewind it back to see again. 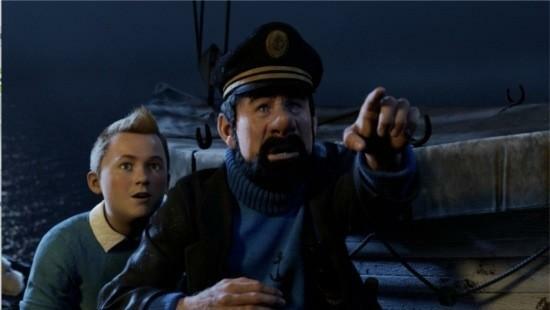 The whole movie is ok up until that point but then Tintin blasts into full force and dazzles you with the unbelievable. It was really fun and that alone made the movie enjoyable for me. If you’re ready for a big dose of action adventure, The Adventures of Tintin is an amusement ride in the form of a movie and you should probably watch it because the sequel is already in the works. Two other pre-certifications are first that it currently scores a 7.8 on 21,946 votes on the IMDb, it is “Certified Fresh” by Rotten Tomatoes with 82% based on 67 Reviews and is at 67% on 11 reviews at Metacritic. If you want the devil’s advocate take there is a discussion link at the bottom of the review, however, if someone who has been as devoted fan for ages and has waited that long for a film version can come away that impressed it is most definitely worth my time. Moreover, the distribution path decision while might’ve seemed obvious to some has reaped rewards for the film as it opens with a bit more buzz stateside than it might otherwise.